(TibetanReview.net, Nov24, 2016) – Members of the Canadian parliament welcomed with rapturous applause an address by Mr Arif Virani, member of the Canadian Parliamentary Friends of Tibet (CPFT), in which he introduced the executive head of the exile Tibetan administration at Dharamshala India, Sikyong Lobsang, with a remark calling him a strong advocate for the middle way approach which “seeks nothing more than a greater autonomy for Tibet within China”. He further said he saluted Dr Sangay, as well as Mr Penpa Tsering, the New York-based official representative of His Holiness the Dalai Lama for North America, for their important work in promoting awareness for the middle way approach. 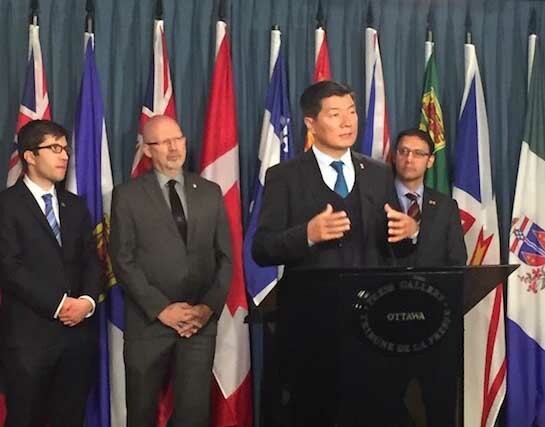 During his three-day visit to Canada’s capital Ottawa, Dr Sangay met with Ms Rona Ambrose, leader of Canada’s opposition party, as well as senior bureaucrats of the Canadian Foreign office, said the exile administration on its Tibet.net website Nov 23. He also met with Mr Charlie Angus, chair of the new Democratic Party, and Mr J Greg Peters, Usher of the Black Rod of the Senate of Canada. CPFT hosted a reception for the Sikyong which was attended by more than two-dozen members of the Canadian Parliament belonging to different political parties.